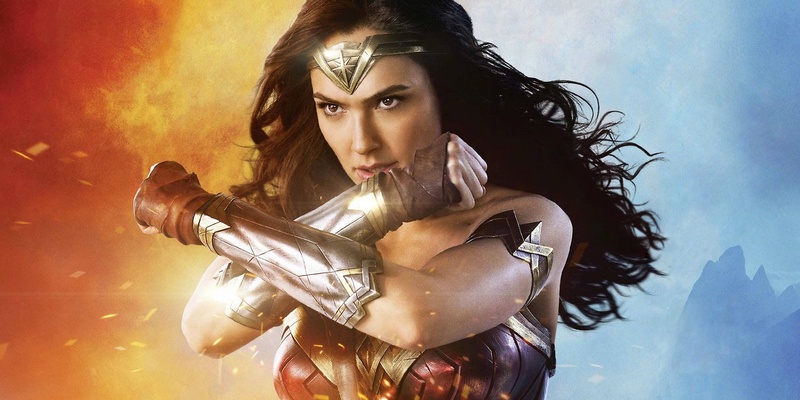 While I’m counting down the hours until I get to see DC’s newest superhero movie, I have to admit that I had rarely felt much of a connection to Wonder Woman, either when I was growing up or now as thirty year old woman. Wonder Woman has always been in the same camp for me as Superman, an alien being of supernatural powers who always does the right thing and would never stray off the correct path. She never felt like a real character, one with thoughts and emotions outside outside of truth, justice and the American Way. Occasionally, in stories like Kingdom Come, there was a glimpse of a different kind of Diana, a woman who comes from a different culture and who doesn’t respond the way that we would expect. It was only this Diana, the imperfect, sometimes ferocious protector that I have ever felt drawn to. In the lead up to the release of the next version of Diana, I wanted to take the time to express what how Diana has been depicted in the graphic novels and my hopes for her in the film. In order to do that, I’m going to be talking about two recent graphic novel series, the New 52 Wonder Woman series by Brian Azzarello and Jeff Chiang which was published from 2012-2015 and the Legend of Wonder Woman mini-series by Renae de Liz and Ray Dillon which was published in 2016. I will probably mention a few other series as well but I think these two are good illustrations of where Wonder Woman can be done justice while still remaining interesting. If you want more on this series, there’s a full review that I had done previously so I’ll just briefly sum this one up: this version changes Diana’s origin to being the result of an illicit encounter between Zeus and Hippolyta (queen of the Amazons), a fact that has been hidden from Diana all her life so that Zeus’ wife Hera won’t find out and murder them all. The series focuses on Diana’s struggle with her demigod status, her less than accepting families and her desire to protect a young, pregnant human woman named Zola. The unknown father of Zola’s child features as a mystery for the series, and when Zeus suddenly disappears, there is a chance that Zola’s child will fulfill a prophecy which terrifies the other Olympians. This leaves Wonder Woman as the sole person standing between Zola and the wrath of the Greek gods. I will admit that I’m not the biggest Azzarello fan. He can create good base characters but never seems able to really bring them to life for me. I can’t help but compare his writing to that of other authors who can make me truly care about the characters. In the case of his Wonder Woman series, he actually does a decent job of making Wonder Woman interesting. He doesn’t fall into the trap of making her a lobotomized child in order to show her naivete in the real world (looking at you New 52 Justice League), she’s fully capable of running her own affairs and can handle her business regardless of the realm she’s in. She’s clever, she’s good in a fight and she never relies on others to save her. All of which I appreciate. But the kicker, and the reason I use this series as an example of how not to handle Wonder Woman, is that the story is godawful. There seems to be this misconception that if you have a character based on Greek myths, you should re-hash every Greek hero’s journey with some “new” twist. Which is bloody boring. If I wanted another Greek hero’s journey, I’d go read ancient mythology. I shouldn’t be getting deja vu from reading a Wonder Woman story. In addition, the other female characters in the story feel like cardboard stereotypes and characters for Wonder Woman to have to rescue or calm down from hysteria. And that’s both frustrating and distracting. What could have been an interesting take on Wonder Woman is dragged down by bad storytelling. Lesson learned: Wonder Woman’s origin places her among Greek myths but if you can’t find a way to connect that to real life and make her story feel relatable, then she’s just another flat, uninspired myth. In this mini-series, Wonder Woman returns to her roots. After betraying her people in a desire for love in her encounter with Theseus and Hercules, Hippolyta, Queen of the Amazons, returns to her people and is given immortality in return for remaining watchful over the island which protects both the new home of the Greek Gods and her own people. Unfortunately, immortality is as much a curse as it is a blessing. Hippolyta must watch the mortals around her be blessed with children provided by the gods (since Themyscira has no men), grow old and die without ever having that connection herself. In her despair, she cries out to the gods and is answered with the gift of a mortal child, Diana, born from clay. The first half of the series focuses on Diana’s growth from precocious child to young adult as she learns what she must in order to act as Hippolyta’s heir, with the knowledge that she will be granted/cursed with immortality as well when she eventually succeeds her mother. The arrival of Steve Trevor, a pawn in a game of the gods, leads to Diana’s departure from her home and everything she’s ever known. 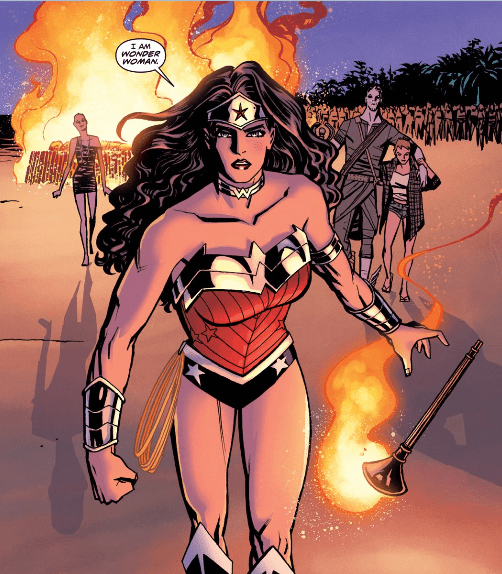 While New 52 placed Diana in present day, in The Legend of Wonder Woman, Diana must navigate the wonders and the horrors of humanity during the second world war if she ever wants to make it back home. 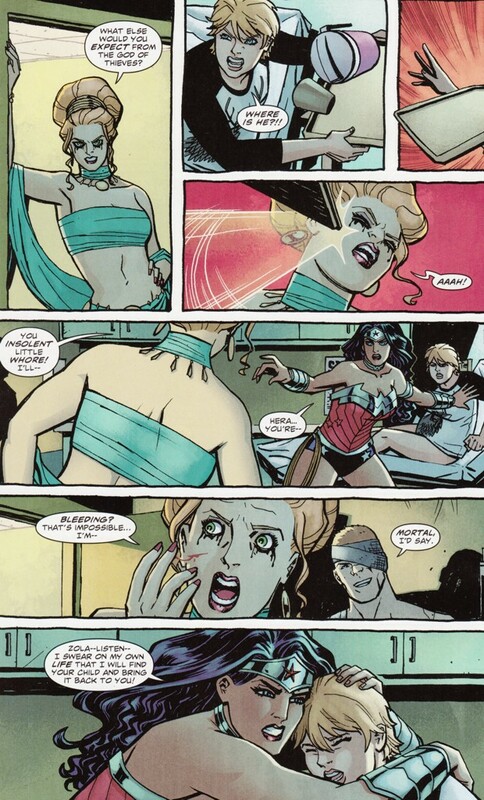 The relationships between all of the women, but particularly Diana and Hippolyta, are spectacularly well done. This is one of the most recent Wonder Woman stories and absolutely one of the best I’ve ever read. While Kingdom Come did a brilliant job of showing the warrior side of Diana, I have never read a story which so completely enthralled me with a full picture of Wonder Woman. 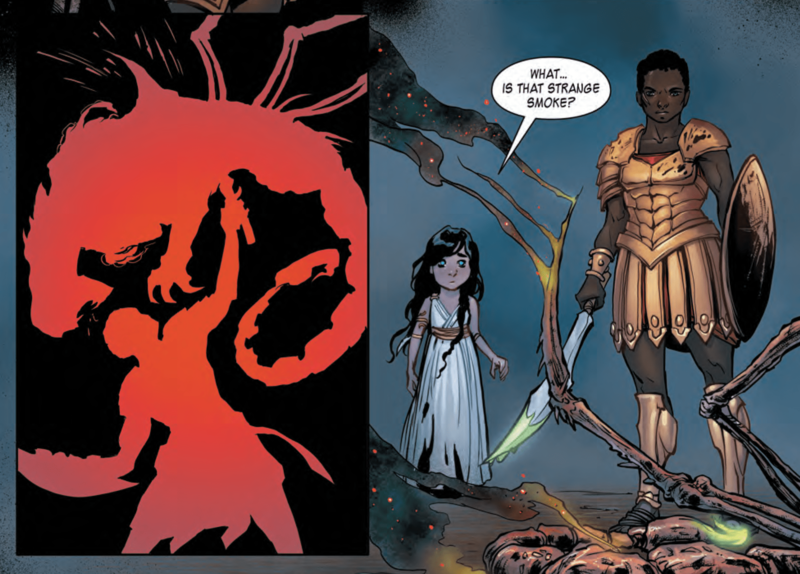 As she grows up, Diana struggles with her assigned role as dutiful princess of the peaceful Themyscira, and her strong sense that something is terribly wrong with Themyscira. As a young girl, she feels a darkness growing in the island, sickening the land and warning the Amazons of terrible things to come. But no others seem to feel this same warning, not until Diana confronts the Themysciran captain of the guard, Alcippe. Despite Diana’s begging, Alcippe has refused to teach her to fight as she is to be a princess of peace. But when Alcippe realizes that Diana feels the same darkness, she finally agrees. 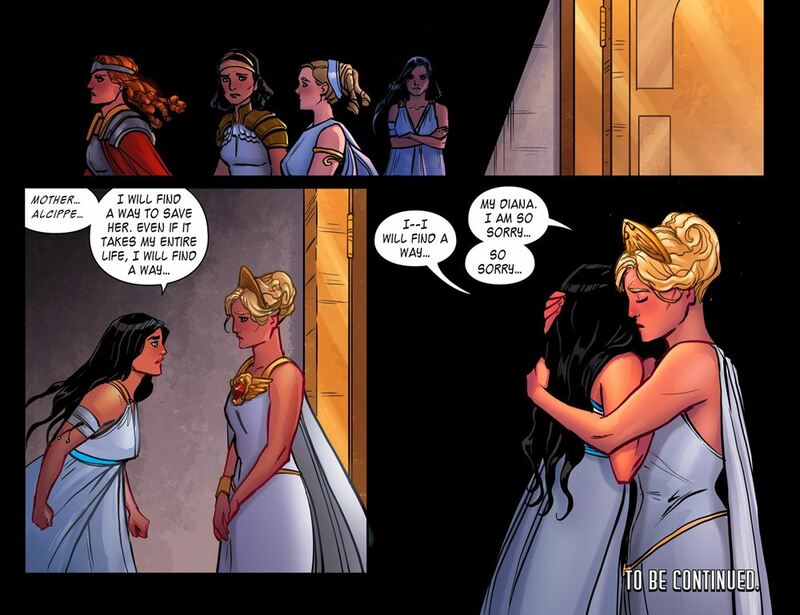 The relationships between Alcippe, Hippolyta and Diana are brilliantly done. This is not a writer telling you that these three women care deeply for each other, De Liz makes you feel every moment of it. All three are complex women with their own needs, duties and desires that all in turn affect how Diana reacts to the “modern” world of the 1940’s. When Diana makes friends with the vivacious Etta Candy, De Liz gives us another woman, with a completely different personality and mindset, who feels as real as the rest. It’s not often that superhero stories have such brilliantly full characterization for anyone but the main characters and I cared deeply about each of them as I was reading. The influence of these women on Diana makes her feel conflicted and therefore, real. While Diana struggles to adapt to a completely different culture, she never feels stupid or naive, just lost in something she doesn’t quite understand. There are some amusing moments where 1940’s society isn’t quite ready to handle an Amazonian princess like her. Unlike the New 52 story, Diana’s drive to help save humanity blends her Greek mythological upbringing with the historical setting of World War II in such a way that immediately draws the reader in and makes them forget every other Wonder Woman story. The art is beautifully done and captures the magic of De Liz’s writing. Lesson learned: Treating Wonder Woman and the other women in her life as living, breathing people who have their own desires and obligations makes Diana feel real in a way that is terribly absent in a lot of Wonder Woman stories. Diana is bastion of hope but not because she never steps a foot wrong. Diana’s drive to protect others and save humanity makes the reader feel compelled to cheer her on in a way that cardboard stereotypes just can’t. Also, readers apparently learned that DC just can’t have nice things because they have cancelled this series after the creators complained on Twitter about the way Diana was represented in other DC series. Perhaps not the best career move but damn it, DC, what a short-sighted, stupidly vindictive move on your part. If the early reviews are any indication, Patty Jenkins might actually have pulled this off. Despite my disappointment with every DC movie since Nolan’s Batman series (and frankly, even some of that was less than I wanted), I have extremely high hopes for this movie. What matters for this movie is that Wonder Woman feels like the center of the story and that she feels real. In too many other stories, like New 52 and the terrible Justice League Origins, Wonder Woman is an alien representation. She might be a badass warrior, but she never feels like a living, breathing person with her own drives and desires. To succeed, the Wonder Woman movie needs to make Diana compelling as her own woman and not just a romance but as the star of the action. I very much hope that the movie takes a page out of De Liz’s book and makes not just Diana interesting but the other characters in the movie, without Steve Trevor’s charm overshadowing Diana’s own. As a female reader of comics who grew up desperately wanting a kickass female character to look up to, I very much want this movie to succeed not only for Wonder Woman but to prove that female action led movies can be brilliant. Please, DC and Patty Jenkins, don’t let us down.